Double Exposure: Edward S. Curtis, Marianne Nicolson, Tracy Rector, Will Wilson closes at SAM on September 9, but here are 8 places you can visit in Seattle (and beyond) where you can continue to widen your lens on Native culture. Indigenous peoples have been living in the Puget Sound area for well over 4,000 years making for a rich but complex history that has left a lasting mark on the region. Despite the hardships faced by Native communities, Native culture continues to thrive. After decades of planning and fundraising, the Duwamish Longhouse & Cultural Center opened its doors to tribal members, visitors, and the community in 2009. Located at a historic archeological site along the Duwamish river in West Seattle, the lobby displays archeological materials from the site and has a resource center filled with photographs, interviews, field notes, and other literature about the Duwamish and coastal Salish people. Visit the longhouse’s gallery and exhibit area—it’s free! In addition, the longhouse holds monthly special events as well as ongoing workshops, demonstrations and lectures. Located on the University of Washington Seattle campus, the wǝɫǝbʔaltxʷ – Intellectual House, pronounced “wah-sheb-altuh,” aims to provide a welcoming space and a supportive educational environment for all Native students. Though this longhouse-style facility is on a college campus and many events are reserved for UW students, it also hosts a variety of different events like film screenings and concerts that are also open to the public. Check out their Facebook page for details on upcoming events. If you’re in Neah Bay be sure to stop by the Makah Cultural & Research Center—the center includes the Makah Museum, as well as the Museum store, Makah Language Program, Archives and Library Department, Makah Education Department, and Tribal Historic Preservation Office. 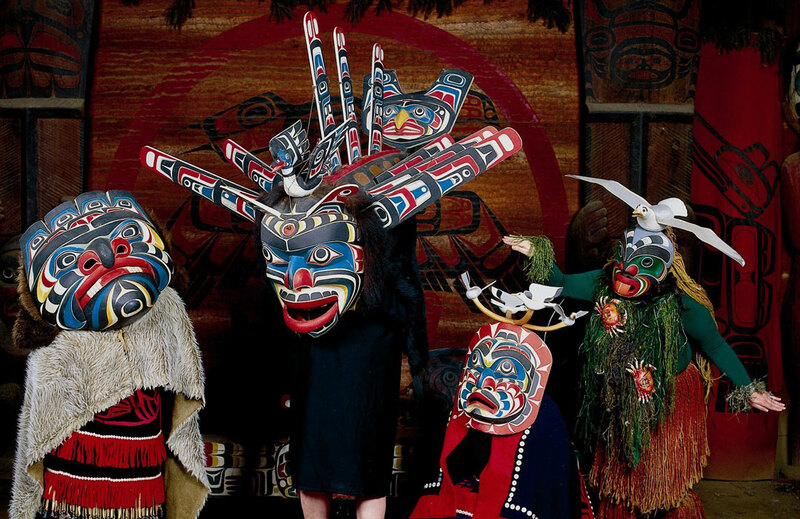 Their permanent collection boasts 300-500 year old artifacts recovered from a Makah village in Ozette, Washington. The Makah Museum also offers demonstrations and lectures by Makah Tribal Leaders plus workshops where you can learn to make crafts from Makah tradition. Daybreak Star Cultural Center tours are live! Please email charris@unitedindians.org and/or ccooper@unitedindians.org for booking. Located in Seattle’s Discovery Park, Sacred Circle Gallery is a gallery space inside of Daybreak Star Indian Cultural Center. Along with a permanent collection of Native American art, they show curated exhibits featuring contemporary and traditional Native American Art by global and local artists. This Port Angeles heritage center is the home of a permanent exhibit of Kallam Village artifacts along with contemporary works by local tribal members. Across the street from the Heritage Center you’ll find The Carnegie Museum, managed by The Lower Elwha Klallam Tribe, the space displays cultural and historical artifacts of the Lower Elwha Klallam Tribe and other tribes of the Olympic Peninsula. Located on the Evergreen State College campus in Olympia, “House of Welcome” Longhouse Education and Cultural Center’s mission is promoting Indigenous arts and cultures through education, cultural preservation, creative expression, and economic development. Come to the longhouse to learn about indigenous arts and cultures through Native art markets, exhibitions, performances, films, and other public events. Learn about the legacy of the Tulalip Tribe and people via interactive displays and stories told in both Lushootseed and English at the Hibulb Cultural Center. In addition to the museum’s permanent collection and rotating special exhibitions, they host public events and workshops from weaving and beading classes to salmon bake fundraisers. And, to top it all off, the Cultural Center also happens to be located on a 50-acre natural history preserve, with a research library and a longhouse! Lelooska Family dancers give audience members an understanding of Northwest Coast First Nations culture in living history performances at the Lelooska Foundation and cultural center. Along with living history performances, the Lelooska Foundation offers classes in traditional Northwest Coast crafts like wood carving, weaving, beading, and more. In addition, the Lelooska Museum holds an immense collection of artifacts from around the globe—check out their website for museum hours and event dates! Images: Photo courtesy of Lelooska Foundation. Photo courtesy of the Longhouse at Evergreen. Photo courtesy of the Hibulb Cultural Center & Natural History Preserve.